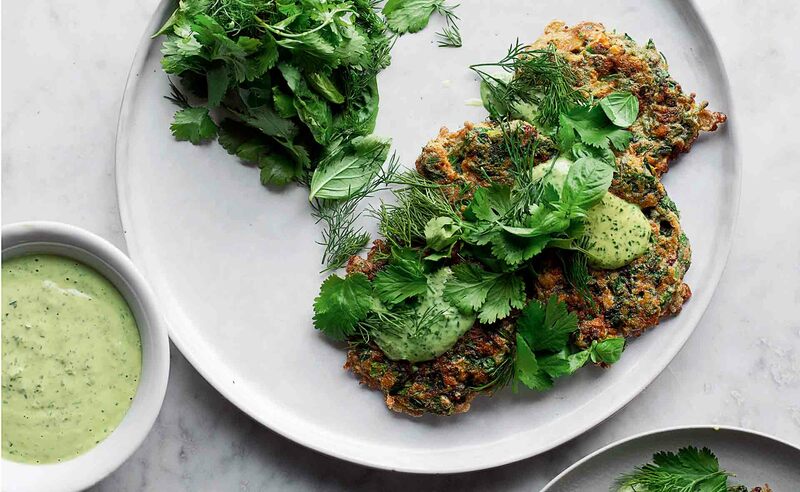 Fritters with a fresh twist, full of the flavour of dill, basil, coriander and cumin. 1. Place all the ingredients, apart from the oil, in a large bowl with ½ teaspoon of salt. Mix well to combine and set aside. 2. Put 2 tablespoons of oil into a large non-stick pan and place on a medium high heat. Once hot, add ladles of batter to the pan. Do 4 fritters at a time, if you can – you want each of them to be about 12cm wide – otherwise just do 2 or 3 at a time. Fry for 1–2 minutes on each side, until crisp and golden-brown. Transfer to a kitchen paper-lined plate and set aside while you continue with the remaining batter and oil. 3. Serve either warm or at room temperature. These can be snacked on as they are, at room temperature, or else served with a green tahini sauce and some extra herbs. If you want to make the tahini sauce then just blitz together 50 g tahini, 30 g parsley, ½ crushed garlic clove, 2 tablespoons lemon juice and 1∕8 teaspoon salt. Once this is all in the blender, blitz for 30 seconds and pour in 125 ml water. Alternatively, pile the fritters into pitta bread with condiments: a combination of yoghurt, chilli sauce, pickled vegetables and tahini works well. This is extracted from Ottolenghi Simple by Yotam Ottolenghi. RRP $49.99 (Penguin Random House Australia), available now from bookstores and online retailers.